Like Friern Barnet, Fryent’s name derives from its early ownership by the friars of the Order of St John of Jerusalem. An original part of the ancient parish of Kingsbury, the Fryent estate was taken over by St Paul’s Cathedral in 1543 and remained in agricul­tural use until the 20th century. Between 1928 and 1931 the Ecclesiastical Commissioners divided up Fryent Farm and sold the parts to several private developers and to Wembley council, which built a large housing estate here after the Second World War. Fryent country park was formed in 1967 by merging Barn Hill and Kenton Lane open spaces with the land of Bush and Hillhouse farms. The park’s 260 acres have an undulating character, reaching a height of 206 feet towards the north-east. 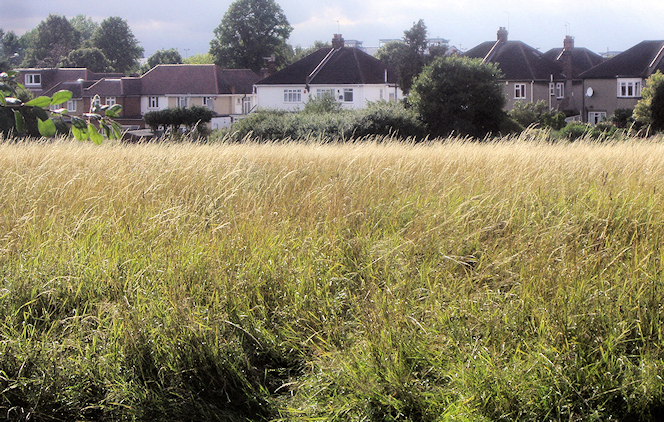 Most of London’s parks were once farmland but usually all trace of their former life has been oblit­erated. Fryent is different; it has an ancient hedgerow system (clearly visible in the satellite image below), farm ponds and hay meadow grass­lands, as well as extensive woodland. Like the rest of Brent, the Fryent ward has a multi­cul­tural population, and most leading faiths are well repres­ented, except for Judaism and Sikhism. Apart from English, the main languages spoken in the area are Gujarati, Urdu, Somali and Arabic. * The picture of the backs of houses on Valley Drive, Fryent Country Park, on this page is adapted from an original photograph, copyright David Howard, at Geograph Britain and Ireland, made available under the Attribution-ShareAlike 2.0 Generic Licence. Any subsequent reuse is hereby freely permitted under the terms of that licence.